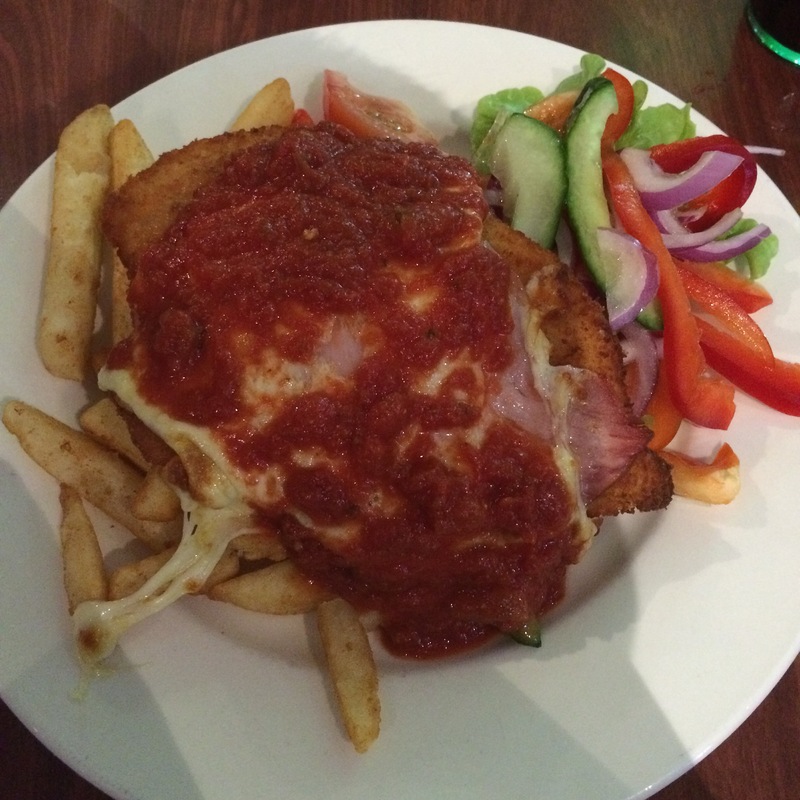 Parma Number 49: The Stafford Tavern … Slip sliding away! The Verdict: When this chicken parmigiana came out my first impression was that it was “why is the sauce on top of the cheese”. Sadly things did not improve from there with the bulk of the cheese and sauce sliding off the chicken piece due to the angle it was presented on the plate. Chicken Piece: This was a very large chicken piece that had been well crumbed and was cooked well. I can not fault this aspect of the dish. Tomato Sauce: The tomato sauce was placed on top of the chicken piece, ham and cheese almost as an afterthought and then proceeded to slide off the chicken when I cut into it. If it had have tasted ok I could have forgiven these aesthetic problems but unfortunately it was also a bit bland. Ham: Whilst the ham on the Stafford Tavern Parma tasted great there was just not enough of it. It did not cover the chicken piece and left me wanting more! Cheese: Gravity was not the cheese’s friend given that most of it ended up off the chicken piece on the edge of the plate with the tomato sauce. I sense though that even if this hadn’t have been a problem there would never have been enough of it. Side dishes: The salad on this dish was its hero but with a massive caveat. The fact is I love capsicum and onion and this salad was probably 50% those elements so if you do not love these flavours this salad may be problematic for you. The chips were obviously from the bain marie rather than freshly cooked and were a bit bland. Presentation: I think you know what I am going to say already but I will say it anyway … The chicken portion of the dish was placed at a jaunty, meal deconstructing angle over the chips. It simply did not fit well on the plate. The Venue: The Stafford Tavern is a large hotel in the suburb which gives it its name. There is a large TAB facility on site and car parking is plentiful. My chicken parmigiana was $17. I should mention the compliment garlic bread which came with our meals which was excellent. The Final Word: This was a pretty disappointing chicken parmigiana to be honest. Aesthetically it was less than pleasing and lack of quality in the some key elements also let it down.